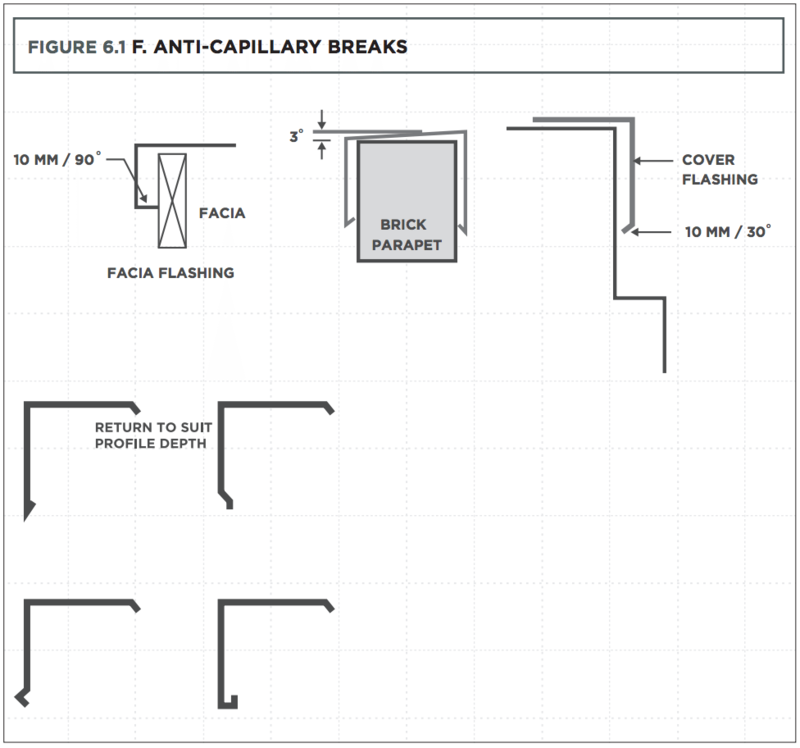 Completed flashings and accessories are defective if they leak under weather conditions anticipated by the BCA. 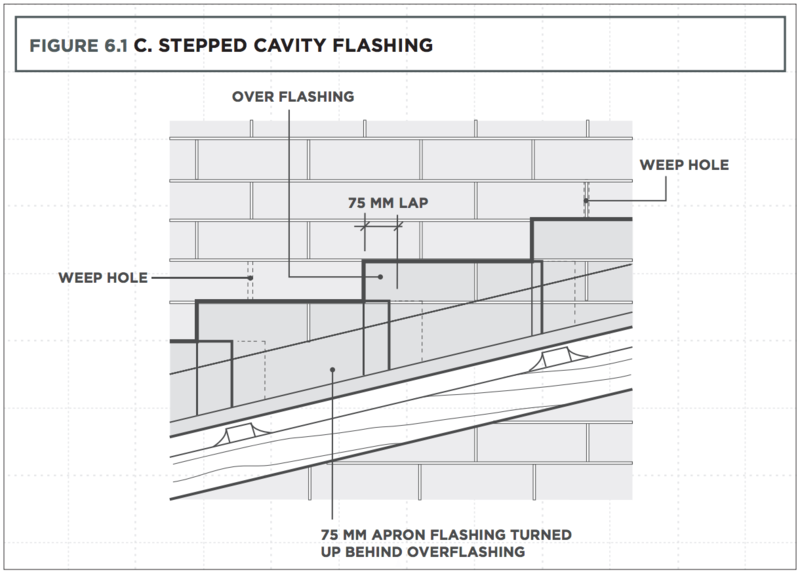 Inadequate construction of roof flashings such as cavity flashings, stepped flashings, parapet flashings, apron flashings and hip and valley flashings are a major cause of leaking roofs. 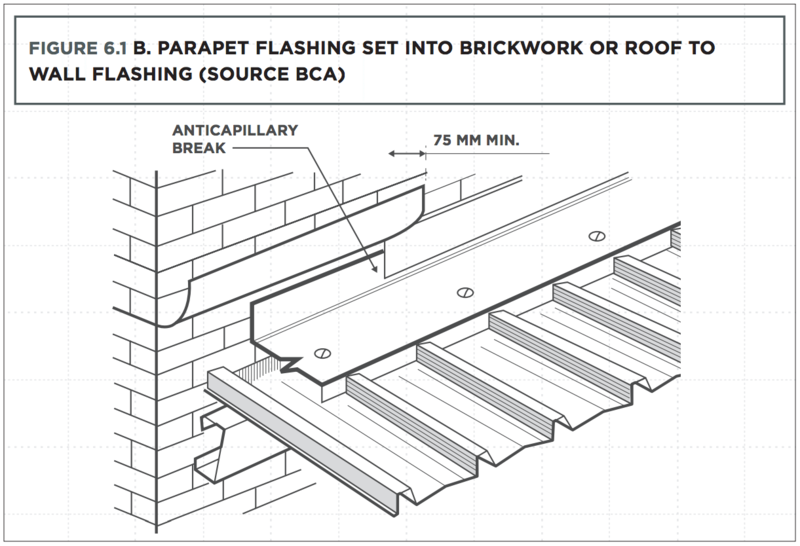 Some recommended flashings details sourced from the BCA, AS Handbook HB39 2015 – installation code for metal roofing and wall cladding and manufacturer’s installation recommendations, are provided in Figure 6.1. 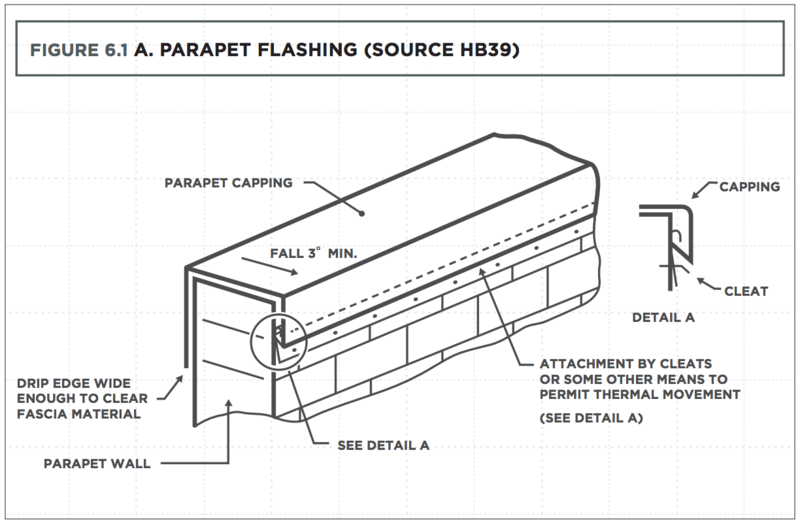 Where a membrane system is used on parapet walls these systems are defective if they are not installed in accordance with AS4654 – Waterproofing membranes for external above-ground use. 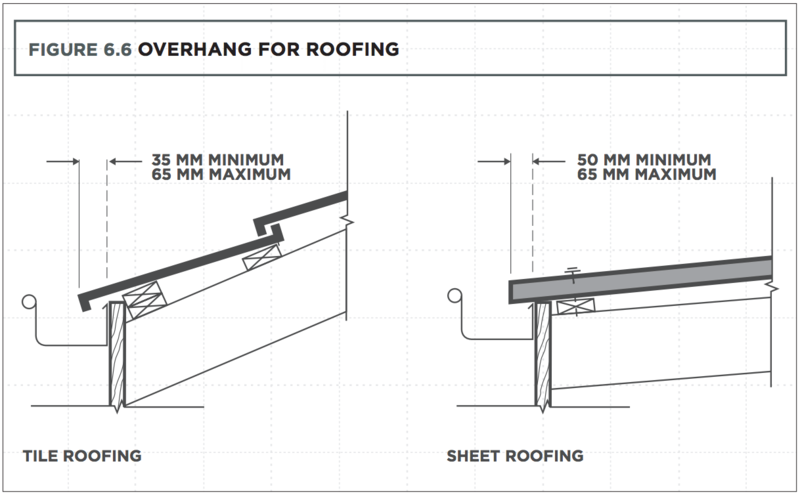 Extract from AS Handbook HB39 – 2015 – Installation code for metal roofing and wall cladding. Roofing and accessories are defective if they leak under weather conditions anticipated by the BCA. 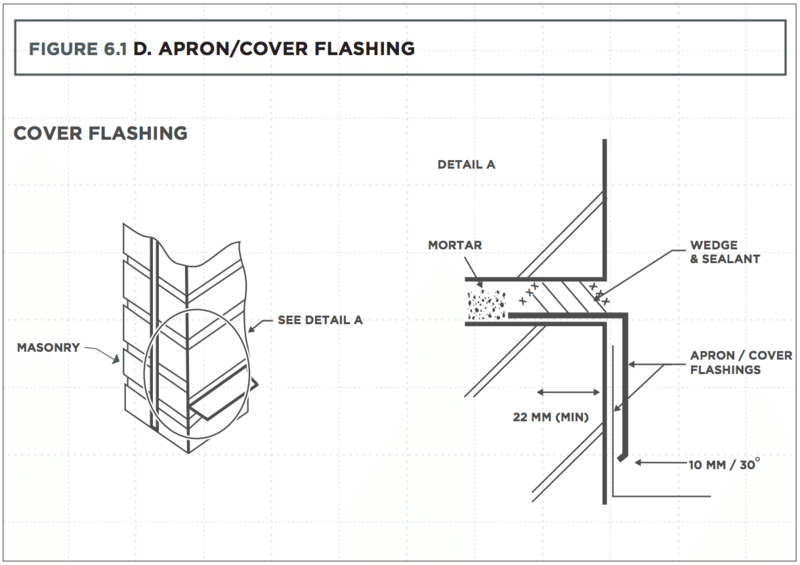 Within 12 months from date of completion of the works, staining, folds, splits, dents, open joints between panels, cracking and other distortions in roof cladding, are defects if they are visible from a normal viewing position at ground level or an upper floor level, unless these imperfections were caused by actions or inactions of the owner, or other persons outside of the contractors control. (e.g. installation on the roof of satellite TV equipment after completion of work by the contractor). Any corrosion of roof cladding is a defect unless caused by actions or inactions of the owner (e.g. inadequate maintenance). Roof cladding and/or flashings screws and other fixings are defective if they do not comply with the corrosion resistance provisions of the BCA for the exposure conditions of the site. 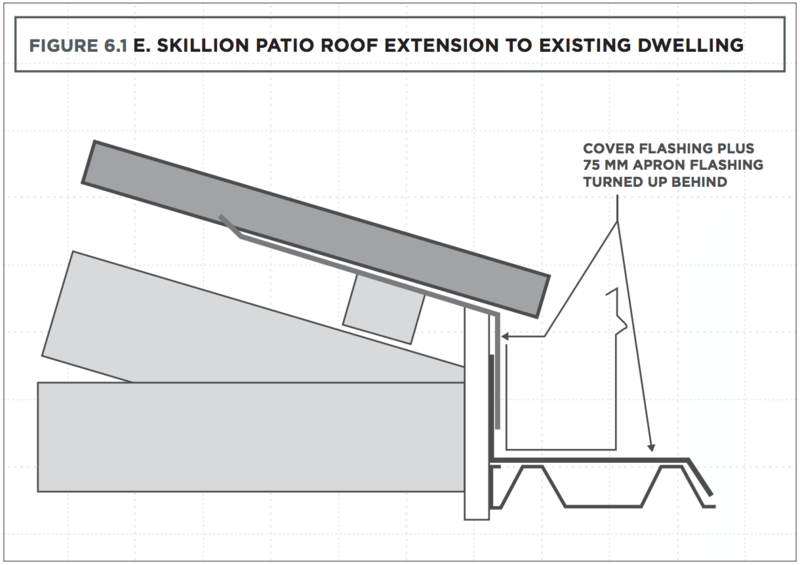 Roof cladding and/or flashings, screws and other fixings are defective if they have not been installed in accordance with the requirements of the BCA and manufacturer’s installation instructions. Roof tiles are defective if they have not been supplied and fixed in accordance with the BCA, AS 2049 – Roof tiles and AS 2050 – Installation of roof tiles and manufacturer’s installation instructions. In accordance with the Roofing Tile Association of Australia Guidance Note in cyclonic wind regions C2 and C3 tiles are defective if flexible pointing material is used as a mechanical fixing product as the sole means of fixing ridge and hip tiles. All such tiles must be fixed with an approved clip or screw or such other method as recommended by the tile manufacturer. In cyclonic wind regions C2 and C3 tiles are defective if all cut tiles are not fixed with an approved clip or screw or such other method as recommended by the tile manufacturer. Within 12 months from completion of the work roof tiles are defective if they do not conform to the manufacturer’s sample. Within 12 months from completion of the work irregularities in tiles are defects if they are visible from a normal viewing position at ground or upper floor levels. Minor surface marks or blemishes arising from the tile manufacturing process are not defects. Unless documented otherwise, the absence of pointing where required by the BCA, AS 2049 – Installation of roof tiles or the contract is a defect. Within 12 months of completion of the work, pointing is defective if it becomes dislodged or washed out. Minor cracking of pointing is not a defect. Within 12 months of completion of the work pointing is defective if it is not uniform in colour, texture and troweled off to provide a neat appearance. The rectification of pointing shall match the existing colour and texture as close as practicable. Tiled roofing is defective if tiles overhang the inside face of a gutter by less than 35 mm or by more than 65 mm. Sheet roofing is defective if it overhangs the inside face of a gutter by less than 50 mm or by more than 65 mm. Refer to Figure 6.6 in this Guide. 6.7 Cutting of roof tiles Within the first 12 months after completion of the work tiles are defective if they are not cut neatly to present a straight line at ridges, hips, verges and valleys. Dry valleys, where they are documented, are defective if they are not constructed in accordance with the BCA or the manufacturer’s installation instructions. Within the first 12 months of completion of the works, undulations in the line of roof tiles are defects if the variation exceeds 20 mm in any 4 m length measured in the roof plane. Trusses or chords of trusses that bow more than the lesser of L/200 or 50 mm are defective, where L is the length of the truss or chord. Trusses or parts of trusses that are erected with a vertical deviation more than the lesser of H/50 or 50 mm are defective, where H is the height of the truss. Sourced from Qld Building and Construction Commission: Standards and Tolerance.